The House Committee on Education and the Workforce recently passed the Student Success Act out of committee on a partisan vote. The bill, which heads to the House floor today, reauthorizes the Elementary and Secondary Education Act, or ESEA, currently known as the No Child Left Behind Act, or NCLB. While NCLB is long overdue for reconsideration, the Student Success Act overlooks the long history this country has of underserving low-income students, English language learners, and students of color. Under the guise of strengthening local control over schools, the Student Success Act bargains away equity. The House majority argues that the bill will “reduce the federal footprint” in education, but the bill does so at the expense of students. The bill weakens federal oversight in areas that have traditionally failed the most disadvantaged students. Here’s what you should know about the Student Success Act. While the Student Success Act requires states to adopt standards in reading and math, the bill does nothing to ensure that state standards are rigorous enough to make sure students graduate from school college and career ready. What’s more, the bill does not require states to set targets and goals to evaluate whether schools are improving student achievement and graduation rates. Under NCLB, states already have a great deal of flexibility in setting their own targets for student achievement. But federal oversight to ensure that states are setting sufficiently ambitious targets has proven to be critical in the years since NCLB was first passed. States that request flexibility from the U.S. Department of Education regarding NCLB’s outdated accountability requirements have the opportunity to redesign their accountability systems and set their own targets and goals for student achievement. The behavior of some states under the department’s flexibility process, however, provides a glimpse of what might arise if a system of checks and balances is not in place. Take House Majority Leader Eric Cantor’s (R) own state, for instance. Virginia’s initial accountability plan, submitted in July 2012, included less ambitious annual academic achievement targets for black students compared to their white peers. Complaints from Virginia advocates and parents swelled, compelling the Department of Education and the Commonwealth of Virginia to negotiate a new accountability plan. But what if federal oversight was limited and states were left to their own accord? What recourse would parents and advocates have then? Under the Student Success Act, not much. Similar to the No Child Left Behind Act, the Student Success Act requires states and districts to annually assess students in reading and math and publicly report those results to parents. Beyond that, however, states and districts have a great deal of discretion over what needs to happen to underperforming schools. Theoretically, chronically underperforming schools can continue to conduct business as usual—endlessly. The idea here is that parents with children in underperforming schools will take it upon themselves to hold schools accountable on their own or rely on states and districts to act in good faith and intervene when schools are failing. But prior to the Obama administration’s revamp of the School Improvement Grant program, when states and districts had broad flexibility over school interventions, few states and districts took bold steps to turn around schools or close them down. It seems fair to ask states and districts that use federal dollars to drive school improvement to abide by some federal parameters, including a reasonable timeline to demonstrate improvement. The Student Success Act neglects to close a well-known federal loophole that allows districts to allocate fewer total dollars to high-poverty schools compared to more affluent schools. In the grand scheme of things, federal dollars make up a very small portion of school funding—a little more than 10 percent. The bulk of school funding comes from state and local tax dollars. But here’s where the federal role matters: Federal Title I dollars are intended to narrow the funding gap between high- and low-poverty schools, and current law requires districts to ensure that schools receiving Title I dollars and those not receiving such funds have comparable resources before federal dollars are added. But the ability of federal Title I dollars to equalize school funding is undermined by a common practice that allows districts to use average teacher-salary figures and teacher-student ratios in their school budget allocations, masking inequities. What’s the cost? Schools that are 90 percent nonwhite spend $733 less per pupil than mostly white schools. These disparities can add up. The average-sized high-minority school is losing out on $443,000 per year, the equivalent of hiring 12 additional first-year teachers or nine veteran teachers. Faced with the opportunity to reduce funding disparities, the House majority bill essentially condones our nation’s longstanding practice of providing high-need schools with the least resources. The Student Success Act also removes federal requirements that ensure states and districts maintain their share of education funding from year to year. The “maintenance of effort” requirement in current law requires districts receiving Title I funds to spend at least 90 percent of what they spent in local and state dollars in the previous year. This provision is meant to prevent districts from slashing their education budgets unscrupulously and provides schools with some reliability in annual funding. As we have warned previously, eliminating the maintenance-of-effort provision “is a recipe for converting federal funds into state and local tax relief,” and many of the arguments for eliminating the provision do not hold water. As House Republicans note themselves, current law already includes a great deal of flexibility for districts seeking relief from this requirement, including states and districts that face a severe funding shortfall due to the tough fiscal climate. In general, however, safeguarding funding for education in exchange for $14.5 billion in Title I dollars seems like a fair shake for districts and states that accept the federal support. In pursuit of flexibility and increased local control, the House Republican bill limits federal oversight in ways that can actually undermine educational opportunities for students. But the Senate ESEA bill that passed out of committee in June, as well as House Education and Workforce Committee Ranking Member George Miller’s (D-CA) proposal, offer a better way forward. These proposals include recommendations that we have outlined in our vision for reauthorizing ESEA. Hold all schools accountable for getting results with all students. ESEA should continue to require states to set high standards and annual goals for all students. Invest in teachers and principals so they become more skilled and effective. States should be required to develop and implement educator evaluation systems to ensure every student has access to a strong teacher. Make funding practices more fair and efficient. This includes requiring districts to show that Title I schools receive comparable dollars to non-Title I schools. Take action and target support to low-performing schools. While ESEA should offer states flexibility in tailoring interventions to schools, federal parameters are necessary to ensure states and districts use federal dollars for effective strategies that are most likely to support school improvement. Invest in innovative practices that bring American schools into the 21st century. These practices should include support for schools to redesign and expand their school calendar and competitive funds that support innovation and education reform. These principles are an essential part of ensuring that all children receive a high-quality education and should form the foundation of a new ESEA. 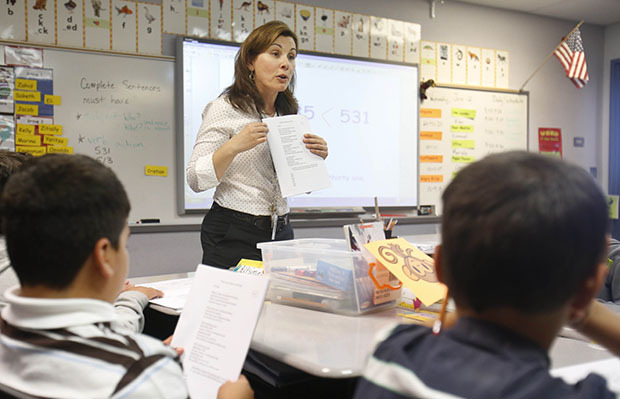 Melissa Lazarín is the Director of K-12 Education Policy at the Center for American Progress.